The follow-up to 2015’s The Pale Emperor was due to be called Say10 and was expected to launch on February 14 this year. However, that date passed with no news. The shock rocker has since been active on his Instagram page, posting a series of short, mysterious videos. And in a brief red carpet interview at the premiere of King Arthur: Legend Of The Sword, Manson gave an update on the record. Speaking about the new material last year, Manson said: “It’s not very much in any way like The pale Emperor. The people who have heard the new songs said it reminded them of Antichrist Superstar and Mechanical Animals – but with a new, different approach. 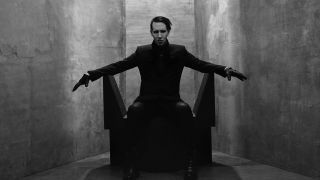 In November last year, Manson released a brief teaser video which saw him tear pages from the bible and focus on the bloodied body of a man in a suit – thought to represent then Republican candidate Donald Trump. Further album and tour details will be revealed in due course.